Officially, no comment on unannounced products. First I have heard of it, especially since the next tablets up on the roadmap are Windows based. As many readers have already pointed out in the comments, perhaps this will be a Windows RT tablet. Time will tell. 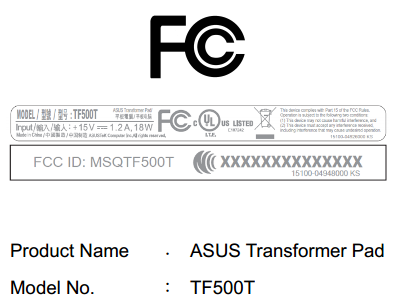 This is a curious one; a mysterious ASUS tablet has shown up out of the blue at the FCC today, with the model name 'TF500T'. Naturally, that places it right in the middle of the company's existing tablet line-up, between the TF300 and TF700, but that's all we have to go on for now. What we do know from the FCC documents is that it will have a Tegra chip in it, indicated by the T at the end of the model name. Besides that, we can only tell you that it will be able to connect over Wi-Fi, and it will contain a HDMI port and a microphone. All fairly standard for a tablet. At this stage, the device could be pretty much anything, but we wouldn't be surprised if it turned out to be a slightly more affordable version of the Infinity (TF700T), much like the Transformer Pad (TF300) is to the Prime (TF700). We have reached out to NVIDIA and ASUS for a comment, so we'll keep you informed if we hear anything back.